Yesterday was about as perfect of a day for a run as one could hope for in late August. It was 58 when I got out of my car with low humidity. I was nervous about this run and it was making my stomach a bit upset, which made me even more nervous, but at least I didn’t have to worry about the conditions. We ran in the neighborhood near the store, which was a blessing and a curse. It’s great because there are many places in which to rack up miles and is hilly, which is great prep for Baltimore, but it can also get monotonous. Our first loop ended up being nearly 14 miles. My right calf was tight through the first 3 miles, which caused my right foot to fall asleep on the uphills, but it worked itself out. Around mile 8 I noticed that my left knee was feeling a little weak laterally, but nothing earth-shattering. Near that same time one of the women I was running with was dealing with some hip tightness while another was dealing with abductor tightness, so we took a stretch break which helped us all. Once I got through that I actually felt pretty good. We only had 5 miles to get through at that point. Totally doable, but also some of the hardest 5 miles I’ve ever run. We purposefully took a hilly route (Baltimore is basically straight uphill from mile 15-20), which was challenging but I think successful for all of us. It wasn’t until about mile 18.5 that the wheels kinda came off the cart. My left thigh starting aching and then hurting. I knew stopping wasn’t an option. I also knew that the direct route I was on wasn’t going to get me to 20 miles. So I ran in circles to get closer to 20, even running in a broad circle while the girl I was with stopped to get a drink. When we finally made it back to the store, my Garmin read 19.93 – and you’re damn straight I ran around the parking lot until it turned over. I immediately cleaned up and changed into dry clothes and made a bee-line for the bagel table and chatted with some people for a bit. 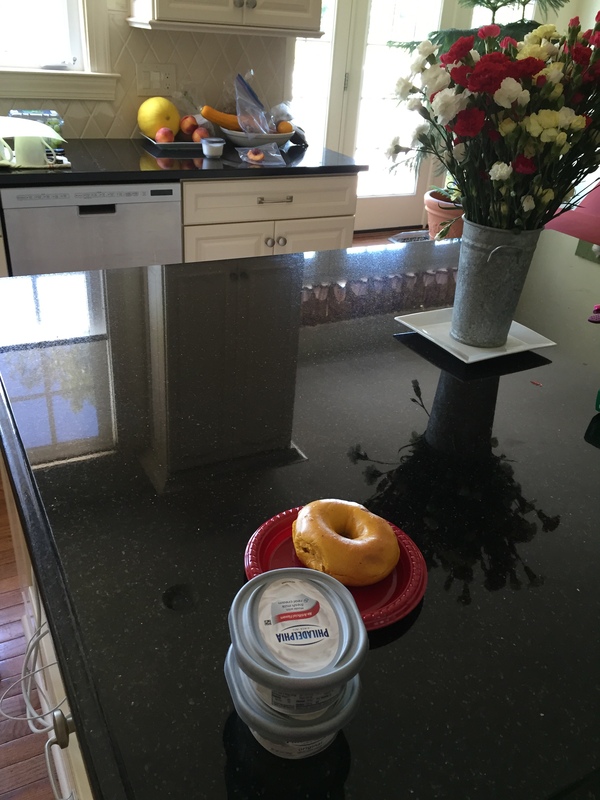 Unfortunately, I wasn’t actually hungry, so I took the bagel to go. Although it didn’t hurt that bad during the run, my left leg was killing me by this point. I needed to lean on something just to use my left leg; stairs were nearly impossible. For only the second time ever, I took an ice bath. Things didn’t turn out well last time. Later last night I spent nearly an hour in the hot tub, which really helped my right leg. Honestly, my right leg feels so great today I could run another 10 miles if both legs felt that good. My left leg, however…. feels like it was repeatedly beaten with a baseball bat. I’m not really sure how to analyze yesterday’s run. It was a success because a) I RAN 20 MILES, b) I ran it faster than I expected to, c) I felt physically and mentally strong throughout nearly the whole run, and d) I learned that the Zealots are keepers. It was less than stellar because a) I tried a new fuel halfway through which made me have to walk and b) I could barely put weight on my left leg afterwards. I still can barely walk. The biggest takeaway is that I RAN 20 MILES!!!! Mentally that’s a HUGE hurdle. I’m still nervous about that extra 10k that I’ll have to run to finish the marathon, but that’s another issue for another day. The biggest problem is that I’m not even sure what exactly I injured or how I injured it, but my left leg and knee are not happy with me. At all. I already had the PT on the schedule for tomorrow morning, but I may be calling the ortho for a proper injury eval. Not words I wanted to utter this late in training. 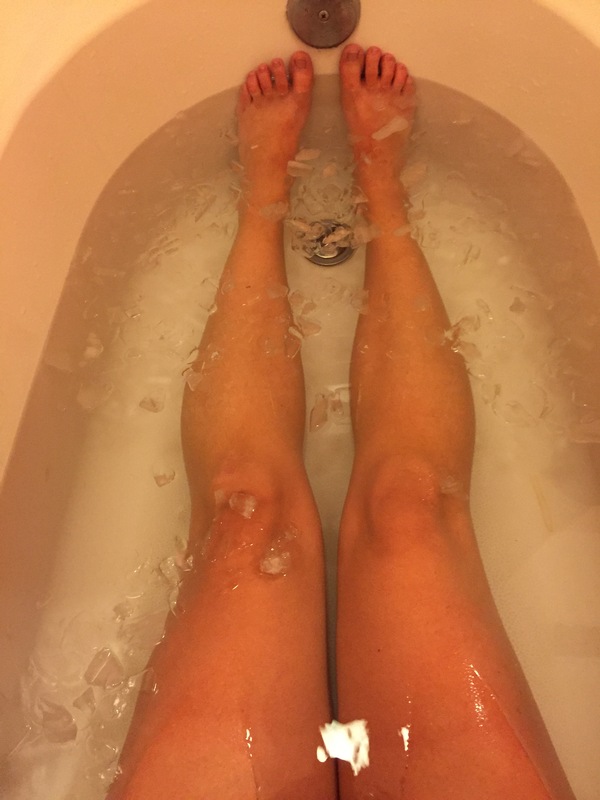 Categories: Uncategorized | Tags: 20 miler, ice bath, injury, long run, marathon training, run, running, summer, summer running, training | Permalink. I both love and hate running downtown. I love it because Baltimore, for all of the issues it has, is a gorgeous city first thing in the morning. It’s truly enjoyable to watch the city wake up. I hate it because, well, where do I begin – it’s super far away so I have to wake up super early, it’s flatter than a pancake, and there’s brick. So much brick. If you haven’t had the opportunity to run on brick, I can’t honestly endorse it. It’s hard. It hurts. 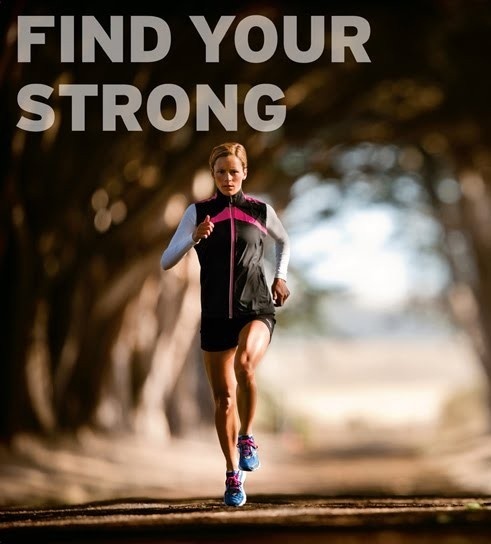 And sometimes bricks heave and create a tripping risk – and lends to you spending more of your run looking at the ground than the scenery. 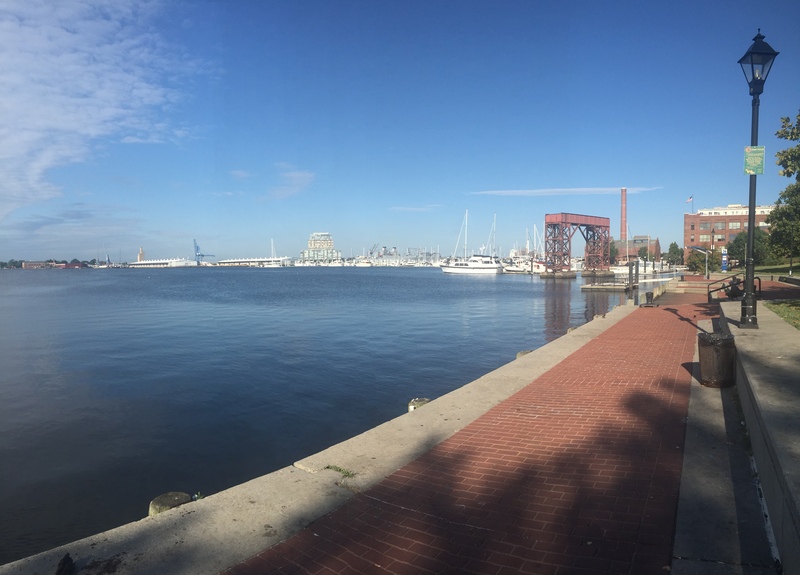 Saturday was a rather perfect day for a run in Baltimore. Upper 60s/low 70s, a nice breeze, a gorgeous sunrise. As I drove from the countryside into the city, all of the farms were covered in a gentle fog, which flowed across the road to the next field like a thin veil. 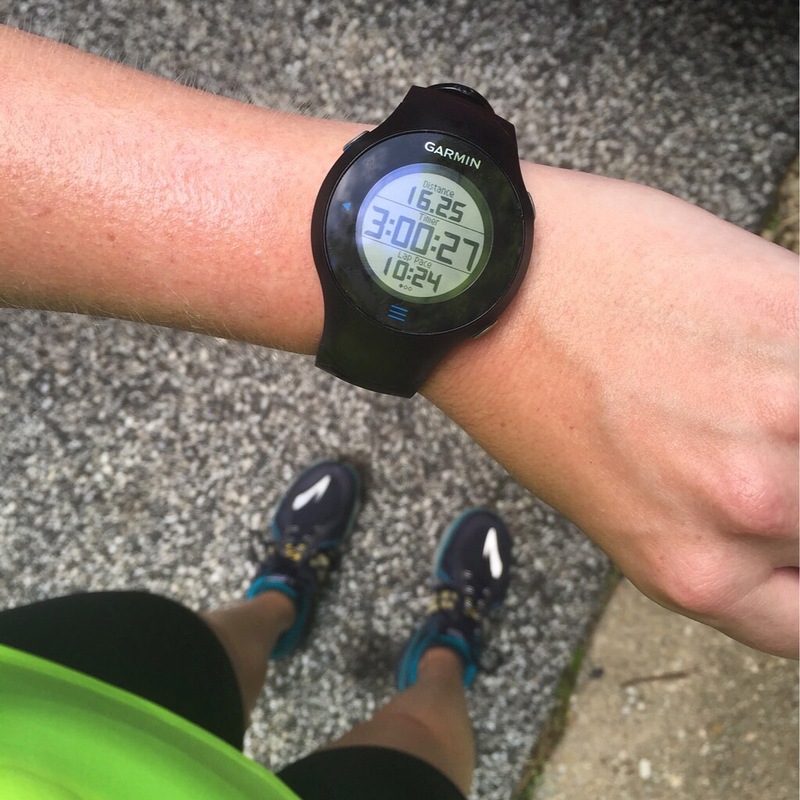 This was to be my longest run to date – 18 miles! Whoa! We started off nice and easy, knowing the trek ahead of us. Our first “landmark” was a spin around the Under Armour campus and Domino Sugar facility (which had a rather unsettling smell…), then we headed for the Inner Harbor, running past the Ritz Carlton, the Science Center, the Constellation, the Torsk, and the Aquarium, meandering up and down every pier to squeeze in as much mileage as possible. We were up and out so early even the ducks on the harbor were still curled up and asleep! 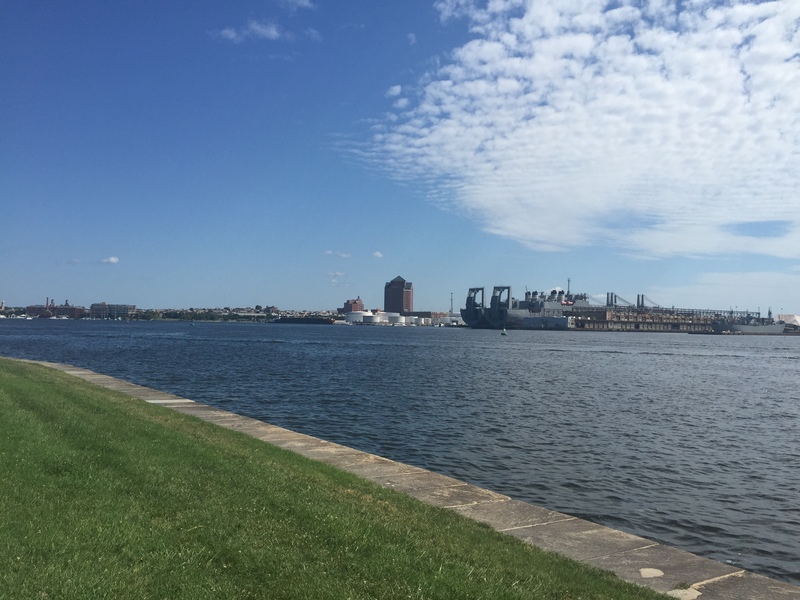 After a quick water stop at the Aquarium, we headed east through Harbor East, past my b-school haunts, and Fells Point, through the Fells Point Farmer’s Market, and on towards Canton. When we reached the end of the Promenade at the Canton Waterfront Park, my Garmin read 6.98 miles. That’s it?!? So we started back, past the sleepy dog walkers clutching their coffee and early-bird tourists. Through the upscale waterfront homes, past the Pirate Ship, and back to the Farmer’s Market we went. Up and down each pier, arms stretched out like wings on the tight turns. We were told the Aquarium water stop would still be functional when we returned, but alas, the well had run dry. As our water supplies dwindled, we aimed for as much shade as possible, hugging the west sides of buildings and running perhaps a bit too close to the folks sitting on the benches (hey, it’s where the shade was). One more lap around Domino and Under Armour and we made a pit stop back at the store to refill. Despite all of the running, we still had 3.75 miles to go! 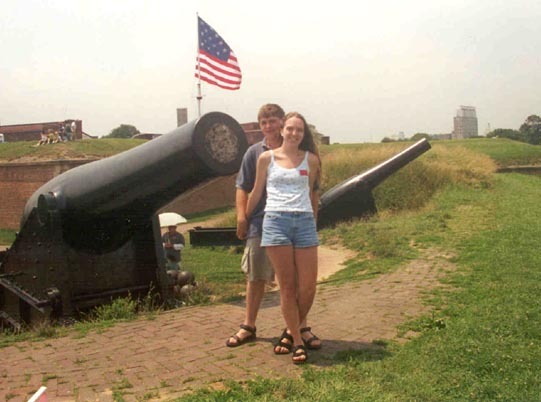 So back out we went, heading west for Fort McHenry. The last time I had been here was almost exactly 15 years ago to the day, and I was really looking forward to seeing it again. We ran down Fort Avenue, enjoying all of the shade from the trees lining the road, saying hello to the old men sitting on the benches. A bridge loomed in the distance, mocking our tired, achey legs. And then the Fort. We ran through the gate, as others ran out, and followed the path around the Fort – a wonderful, 360 degree view of all that is Baltimore. 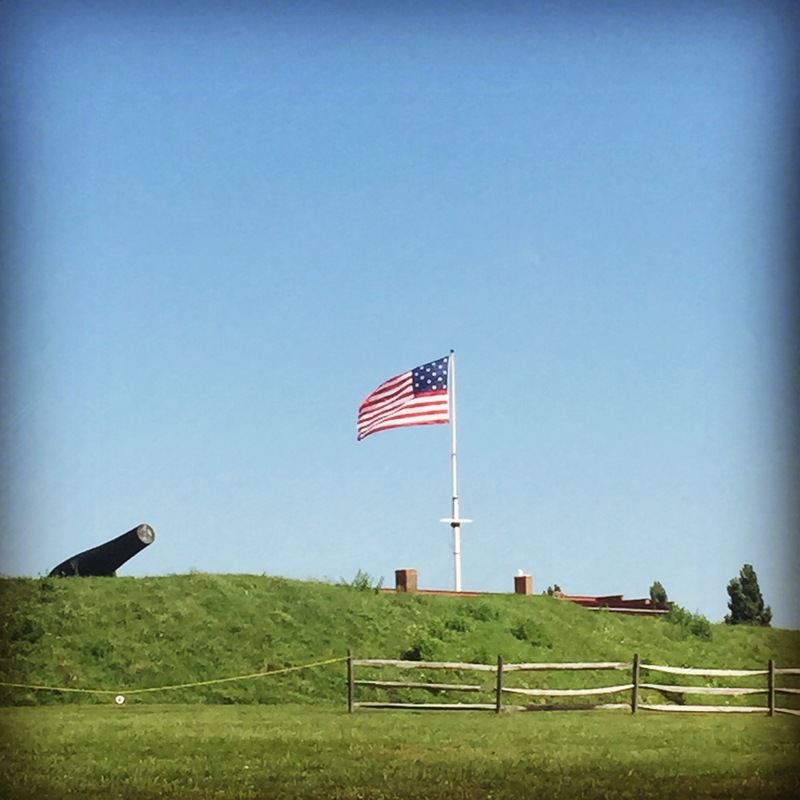 End to end: the Canton Waterfront Park, seen from Fort McHenry. It looks so much closer from here! As the sun blared down on our shoulders, we made our way past the visitor’s center and back out of the gate, over the bridge, and past the old men on the bench. My feet were screaming, my shoulders ached, and my mind tried every coercive method it had in its bag of tricks to get me to stop, but I kept going. No matter how much I hurt, I was not about to stop this close to the goal. Yes, we looked silly, and yes, we thought about stopping more than once, but we kept going, back and forth, up and down Fort Avenue as the Garmin slowly crept closer towards the goal. After the third pass, we turned in towards the store, and it finally beeped. 18 miles. 18 miles!!! 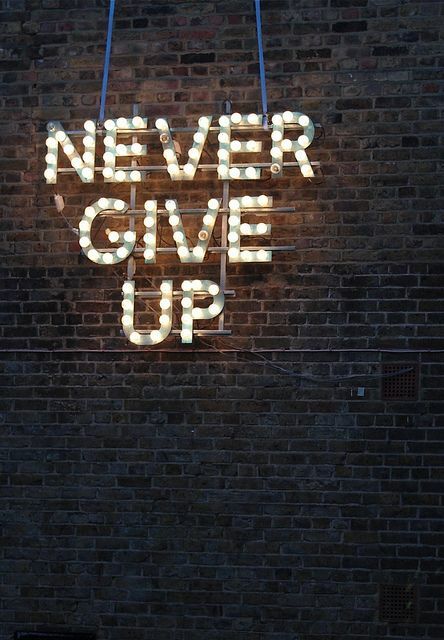 We stopped running, and our walk was as slow as a crawl – a horrible, painful crawl – but we did it. 18 miles. There wasn’t a spot on my body that didn’t hurt, but my mind felt nothing but pride. 18 miles!! The girl who used to come up with every excuse in the book to get out of gym class voluntarily woke up at 4:45am on a Saturday and ran 18 miles. 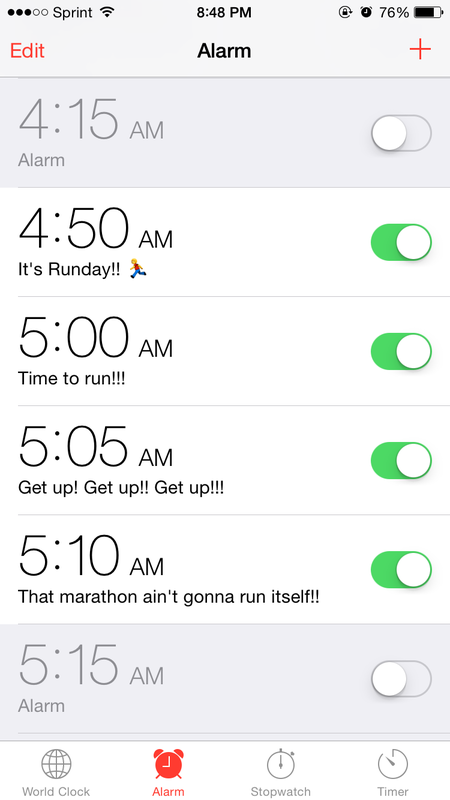 Categories: Uncategorized | Tags: Baltimore, long run, marathon training, run, running, summer running, training | Permalink. As awful as last weekend’s run was, as horrible as the asthma attack was on Tuesday – this was that awesome and then some. Well, except for that early wakeup call thing. That wasn’t so awesome (nor was the infomercial I suffered through until the local news came on at 5:00am). 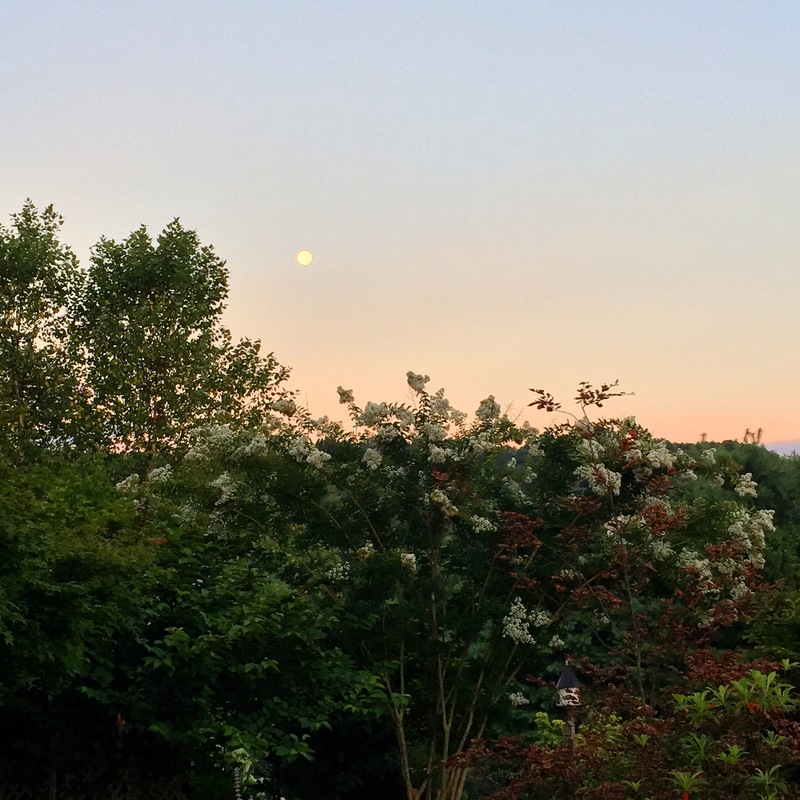 Last night’s blue moon was still hanging around this morning – which was extra spectacular when the sun rose opposite of it. After last week’s near-bonk, I made sure to pay extra close attention to how I ate this week and reevaluated my fueling plan for the long run. So basically I spent all day yesterday shoving any and all carbs into my face. Despite the five blisters I picked up in DC on Thursday, I laced up my third pair of new shoes (Asics Gel Kayanos), filled my hydration pack to the brim, and off we went! Jennie was still a bit stiff from her training this week and I was more than happy to keep a slower pace so we could get through this run in one piece. Around mile 3 we saw a bald eagle soaring over the reservoir – so pretty 🙂 The hills are coming more and more easily, though they’re not easy just yet. The new shoes felt really great, except for my left forefoot. I get this odd pain there, something I’ve been dealing with for as long as I can remember. It was noticeable on the uphills, but not on the downhills. I’m going in for a running evaluation this week, so I’m interested in picking their brains as to why this is. Because of the length of our run, we did two passes of the reservoir. On the second pass, I switched out my shoes and put my old Brooks PureCadences on – instantaneous relief for my forefoot. Not so great for the achilles… but I’ve got to pick my battles. We took the second set of hills in stride, making sure to hydrate early and often, and keeping up with our fueling strategy. Towards the end of the run, I actually started to feel hungry – which is why I brought along a Honey Stinger to try out! They’re not half bad – but they are a bit dry, which made getting it down more entertaining than I really ought to have been… Once that was down, we tackled the last hill pass. Bad choice. Problem a) my stomach isn’t used to solid food on the run. Problem b) when you run hard, your stomach gets last dibs on blood. After the first hill I had to walk for a quick bit to let things calm down, but then was fine for the rest of the run. I remember – not that long ago – when I struggled to hit 16 miles in a week. Talk about progress. Categories: Uncategorized | Tags: hills, long run, marathon training, run, running, training | Permalink. I swear the summer just started… how is the end of July already?? ☀️ I’m not ready for this. Thursday night I took a pair of Mizuno Wave Inspires out for a test run around the track. Despite not being sure about them while standing (they hit my ankle bone), they felt surprisingly good. I did 3×1600 in them, one at a warm up pace, one at a speedy pace, and one at an easy pace and they felt good in all three conditions. Seeing as they passed the first test, I decided to hold on to them for Saturday’s long run. 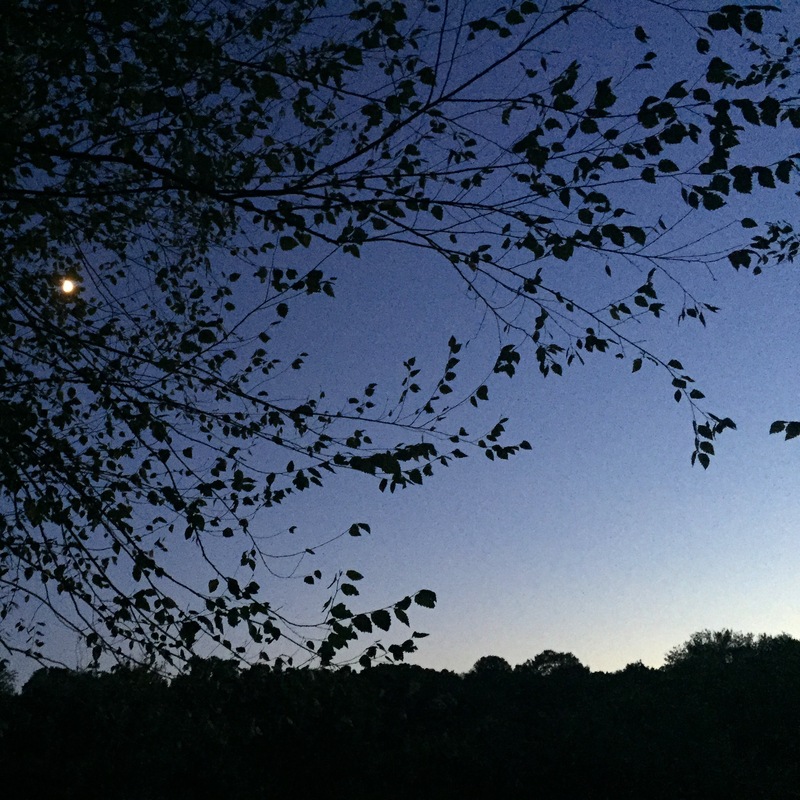 Yesterday we set out for 14 miles – my third time at this distance. I loaded up my hydration vest with 3 16.9 oz bottles of water and three Gus (I always like to have at least one extra on hand) and off we went. The run felt pretty good through the first couple of miles. The hill work is clearly paying off because the hills on the course weren’t so bad. We stopped at mile 5 to Gu and watch a few rabbits chase each other through a yard, and then crossed the main road that divides our zip code. We weaved our way through some neighborhoods, and then decided to wing it a bit – the route sheet had us going back up the road we take out from the store, something none of us wanted to do. As we came upon an elementary school, I noticed that my vest was getting light (and the group water tanks were getting low) so we ran around the school looking for a water fountain; we found two, but both were turned off. Luckily my running partners are more well prepared than I – we stopped at a convenience store for water. Lesson learned – always carry cash or a credit card. Just before we stopped, around mile 9, I had commented on how great the run felt. Apparently the universe wanted nothing to do with that. As the clock approached 10:00am, the sun was getting noticeably hotter and shade was becoming more and more scarce. Almost the entire last 4 miles were in the direct sun; we hopped between shady spots as often as possible, but that only helped so much. I didn’t fall apart, but I didn’t feel good. I had a hard time finishing, but we all cheered each other on and did our best. 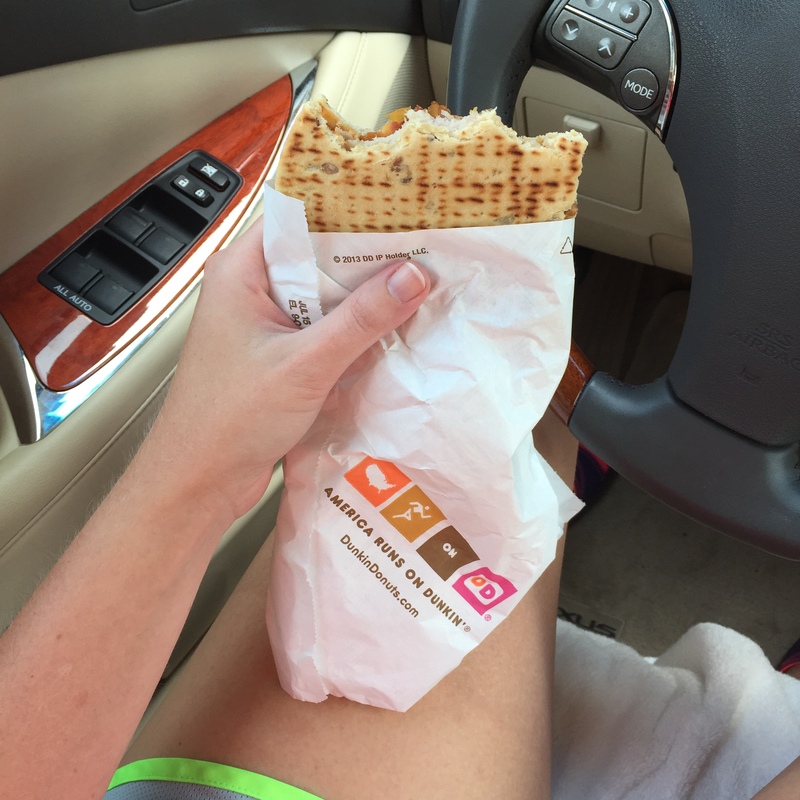 I followed my usual fueling plan before and during the run, but I just felt so drained – and unusually hungry after the run. I’m sure the sun had something to do with it, but it wasn’t all that hot or humid out. I’m going to try a few fueling strategy this upcoming week (16 miles!) – I picked up some Honey Stingers and I’m also going to pack some stroopwafles (which I hear the guys on the Tour de France love for fuel on the go) and see if they help out any. Carbs the day before also need to be upped. Either way, after I cleaned up and chatted with some group members, I made a beeline for Dunkin Donuts and did some damage to a turkey cheddar bacon flatbread. Healthy? Not so much. But it’s got carbs and protein and is super yum. 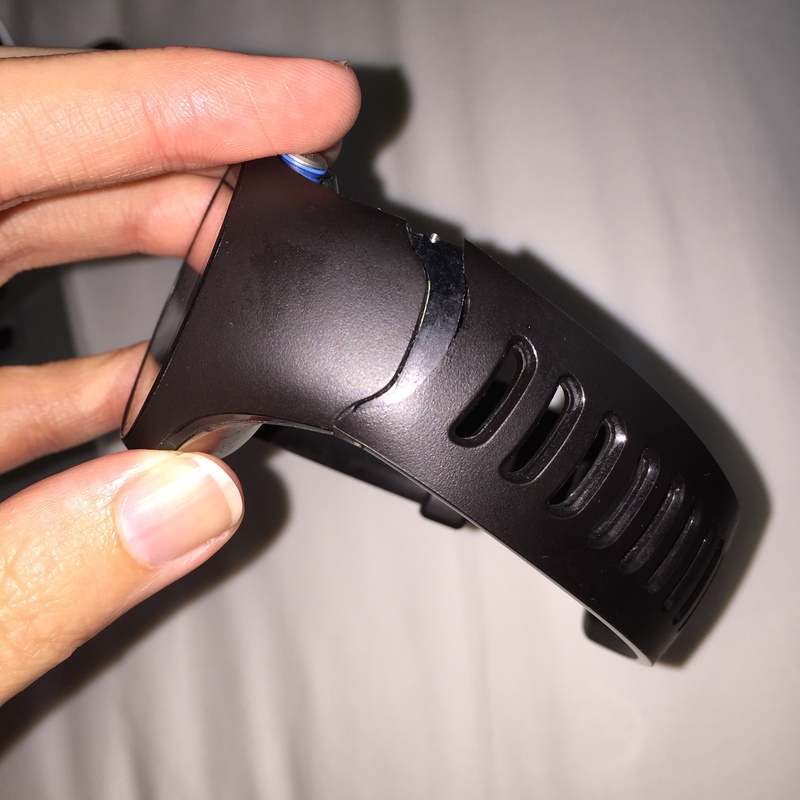 Unfortunately I also found out that my Garmin had broken 😦 The band half popped off. I’ve been told that Garmin’s customer support is pretty good, so I’m going to call them first thing tomorrow morning. This morning I woke up earlyish (okay not really but I sleep like a log after these long runs) and took my mom out to my favorite hill! 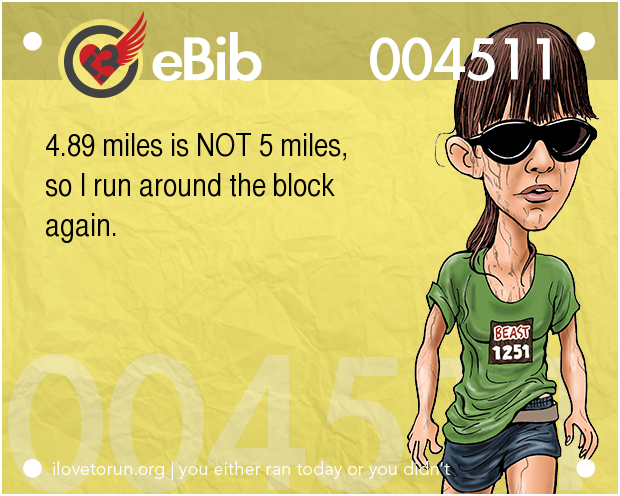 She’s running a race in mid-September that ends on a pretty sizable uphill. I had her run .75 mi on flat trail, then 3 repeats up the hill. She did a whole lot better than I expected! That’s a tough hill! And it was her first time on a real hill. I think she’s just jealous. Has this summer absolutely flown by for you, too?? Categories: Uncategorized | Tags: 14 miler, hills, long run, marathon training, new shoes, run, running, summer running, training, training run | Permalink. Since the weekend, much of the east coast has been slogged in under some miserably hot, humid air. It’s funny how even a slight uptick in the heat and/or humidity – no less both – can make an easy run feel anything but. Last week was a cutback for me and my group. We had built up for 4 long runs, and the easier week was certainly welcomed by all. Because of the pressure in my tibia, I had taken all last week off. 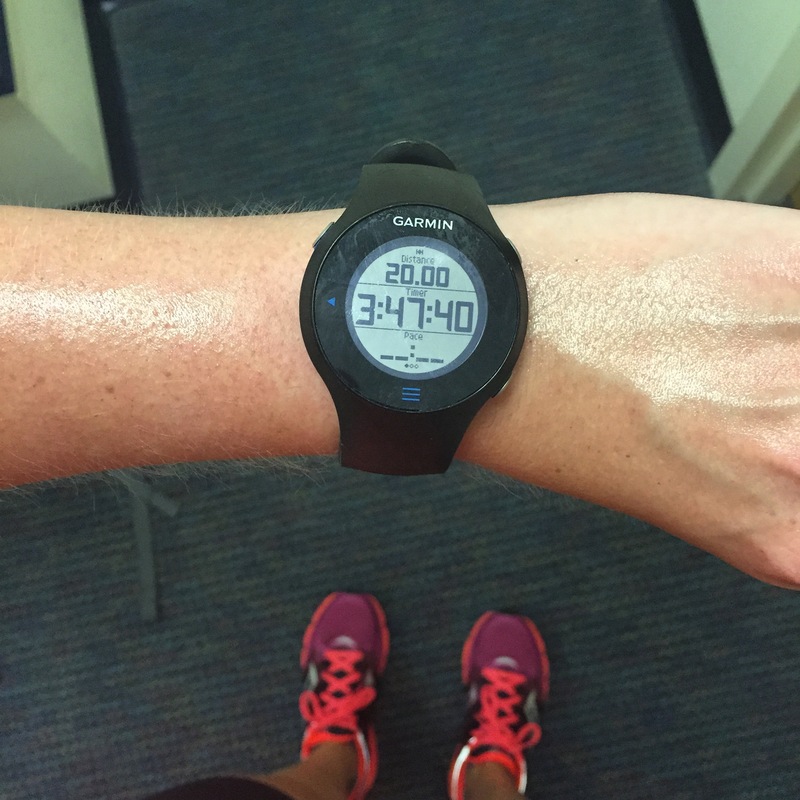 My PT cleared me to run this weekend – if any only if there was no pain. So Saturday morning I woke up at 4:55am, not quite so bright-eyed-and-bushy-tailed, and took my new shoes out for a spin. The trail was unusually packed for that time of morning, but I suspect that’s because it was almost exactly 3 months until race day! I’m sure lots of people were starting their 12-week training programs, while others were trying to get in the miles before the temps rose too far. My marathon group, along with the half marathon group and 12 miler group were there, running all sorts of different distances. 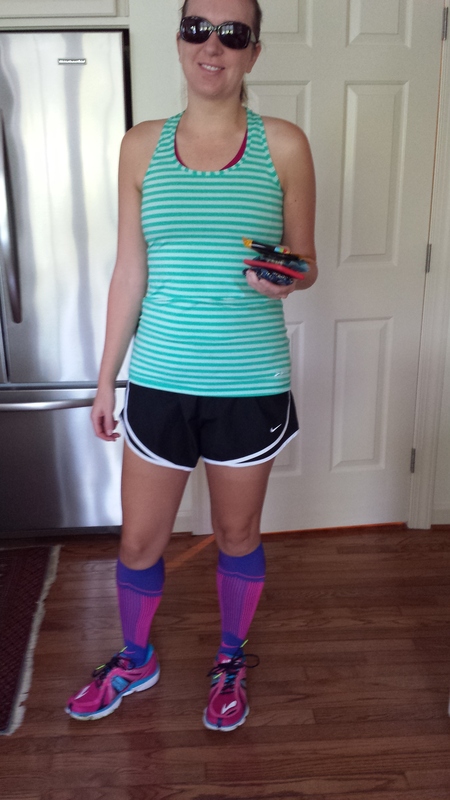 I had originally intended to do 10 miles, but Jennie said she was only doing 8, which sounded like a brilliant plan. 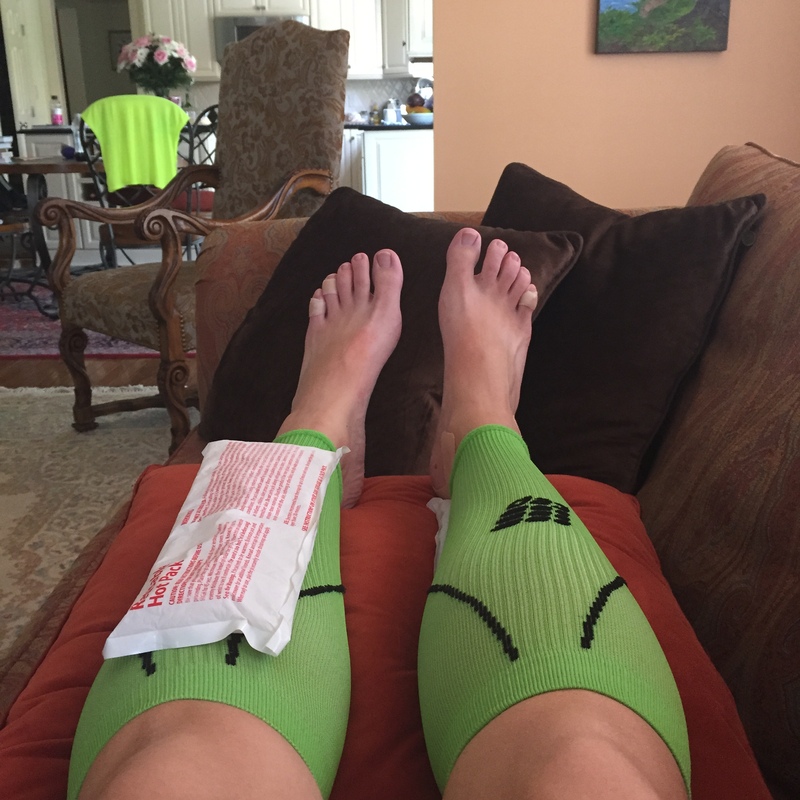 The new shoes gave me some troubles in the first few miles, causing an old shin splint to flare up for the first time in several years – but there was no bone pain, so I kept going. We were holding a 10:40-ish pace, which would normally be perfectly comfortable, but the humidity was so oppressive I just couldn’t hold that for the duration. I felt so silly asking Jennie if we can slow down at mile 3, but I just knew there was no way that I could maintain that. When we got to the first water stop at 3.3 miles, I was soaking wet. We stopped in the shade for a few to grab a drink and cool down a bit, then headed on our way. We stopped again at the same spot on the return trip. I had brought a gu with me but decided against using it. I could’ve used the electrolytes in it, but I also wanted to do a bit of a modified depletion run (modified because I did have a small brekkie before the run). It was definitely one of the tougher runs of my life, averaging only 11:04 and having to walk for a few in mile 6, but we got it done. As hot as Saturday was, my friend Lauren was a total beast and ran the New York City Triathlon on Sunday – a day which was probably even hotter and more humid. It was her first triathlon and she totally rocked it! My mom’s new 11k training group also started Sunday and she went out there and totally killed it in conditions that left me sitting indoors all day. Woohoo!! Luckily last night some storms came through (just after I got into my car!) 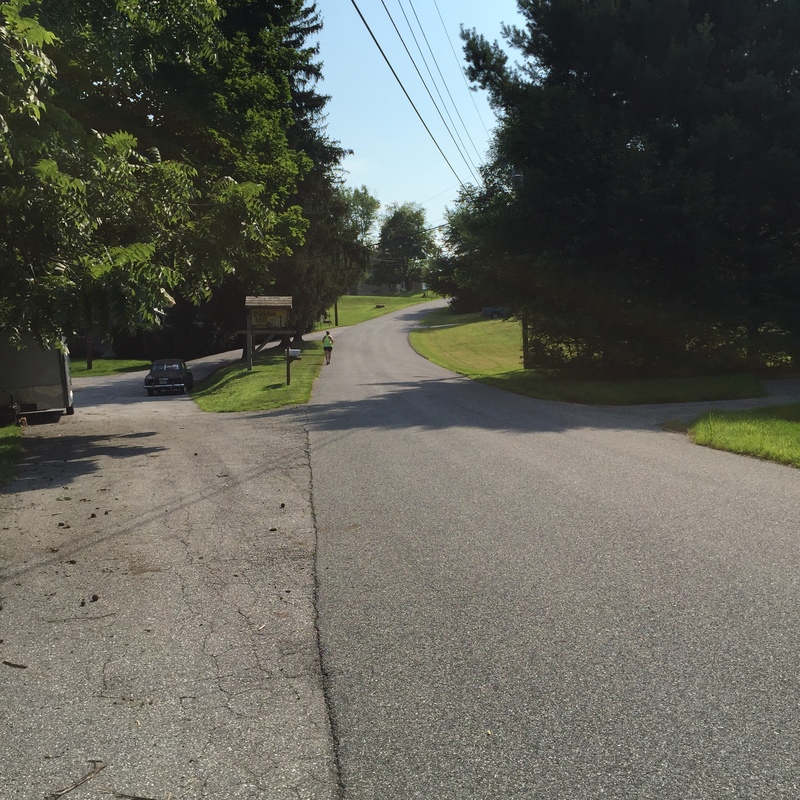 and cleared out the oppressive humidity – it should be a good week for running! Tonight’s plan is cross training and strength while watching the Tour de France (so sad about Tejay… he was doing so amazingly well), and tomorrow I’m going to take another new pair of shoes (Mizuno Wave Inspire) out for a spin to see if maybe they’ll do the trick. Categories: Uncategorized | Tags: hot, humid, humidity, long run, marathon training, run, running, speedwork, summer, summer running, summer storms, sweltering, track, training | Permalink. As if Tuesday’s hill workout wasn’t enough torture, we hit up the reservoir for 14 hilly miles this morning. I love running at the reservoir and was super excited about this – my legs even stopped hurting just in time! It wasn’t the easiest run, but it wasn’t as hard as I was expecting. My legs felt heavy but I was able to power through all of the hills (and there were a lot of them!). I’m really enjoying the feeling of strong quads. Categories: Uncategorized | Tags: alterg, hills, injury, long run, marathon training, PT, run, running, training | Permalink.